Mercedes has completed its five continent world autonomous tour with the rigours of driverless motoring in the specific conditions of US roads. When the school bus stops, all other vehicles around have to stop too. Speed limit signs exist that are not found anywhere else in the world. There are dedicated lanes for carpools, laws permitting traffic overtaking on the right, and lane markings consisting of raised “dots” instead of painted lines. Road traffic in the USA makes many specific demands on the sensor systems and algorithms of vehicles equipped with automated and autonomous technology. The aim of the Intelligent World Drive on five continents was to gain worldwide insight into real traffic conditions so that future, more automated driving systems can be adapted to country-specific traffic and user habits. 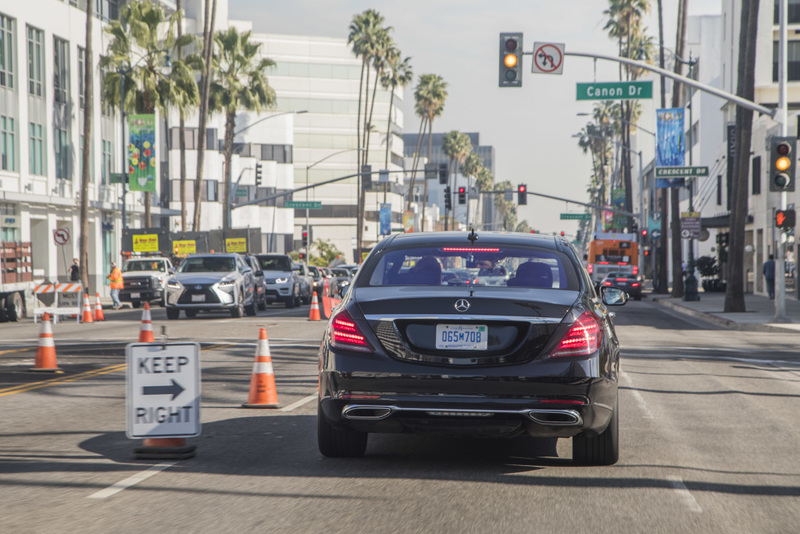 On the final leg of the Mercedes‑Benz Intelligent World Drive in California and Nevada, the test vehicle – based on the S‑Class series-production saloon – gathered valuable, USA-specific information for the further development of driving assistance systems. The automated test drives in the greater Los Angeles area concentrated on the assessment of driving behaviour in dense city traffic and on highways. The focus was particularly on the recognition of school buses, lane markings and speed limit signs. School buses are unique road users in the USA. As soon as they stop and switch on their warning lights, all vehicles in the immediate vicinity must also stop. No vehicle is allowed to pass – even in the opposite direction. Vehicles equipped with automated and autonomous driving technology must be able to distinguish school buses from all other vehicles, and recognise when they are stopping to let children get in and out. An equally demanding task for camera and radar systems is identifying separate carpool lanes, which are reserved exclusively for vehicles in which at least two people are sharing a ride. These so-called HOV lanes (high-occupancy vehicle lanes) can be found on multi-lane interstates and freeways in urban areas. For the sensors and algorithms of automated and autonomous driving technology, it is difficult to recognise these as special lanes and distinguish them from normal or exit lanes. Moreover, the lanes are not always in the same position, and can be on the left, right or centre of the highway. HOV lanes can also be separated from the other lanes by two uninterrupted yellow lines, or by metal guard rails, or they may be identified by painted diamonds. In the future, autonomous driving will also require that the system knows the number of occupants in the vehicle to ascertain whether they are permitted to use the carpool lane. This is because in metropolitan areas, there are also HOV lanes that are only permitted for carpools of three or more (e.g. Los Angeles) or even four or more people (e.g. New York). The so-called Botts’ Dots are a further challenge for the sensor systems and algorithms of vehicles equipped with automated and autonomous driving technology. In many US states, these plastic or ceramic dots are used to mark driving lanes on highways instead of the usual painted lines. Driving automation features such as Active Lane Keeping Assist and Active Steering Assist must be capable of consistently recognising them in order to operate dependably, which is a challenge. With an eye to facilitating the fully-automated driving of the future, the US state of California is planning to harmonise all lane markings and to gradually remove the Botts’ dots, which are believed to total around 20 million in all. Furthermore, US speed limit signs are just as unique. They have a completely different shape and size than in Europe, Australia, Asia and Canada, and even within the USA, the design of speed limit signs can vary. The Intelligent World Drive started at the International Motor Show (IAA) in Frankfurt in September 2017. In five months the automated test vehicle was subjected to numerous complex traffic situations on five continents to explore the limits of the current driving assistance systems and their compatibility with driving conditions around the globe. This allowed Mercedes-Benz to gain global insights into real traffic conditions and gather valuable, country-specific information for the further development of the technologies involved. The first test drive took place in Germany in September. The focus was on assessing the specific driving behaviour on motorways and in traffic jams. On the second leg in October the automated S‑Class was subjected to the extremely dense traffic flow in the Chinese metropolis Shanghai, collecting information about characteristics such as lane-specific speed limits and lane markings with several meanings. In November the automated S‑Class faced the special features of road traffic in Australia. The test drives from Sydney to Melbourne and its city traffic concentrated on validating the current digital map material of HERE MAPS and the recognition of country-specific traffic signs such as the electronic signs showing variable speed limits and the uniquely Australian “hook turn” sign for turning right across railway tracks in Melbourne. The focus of the fourth leg in South Africa in December was on pedestrian recognition in many unfamiliar situations in dense city traffic and on country roads, and on validating the digital map material of HERE MAPS.